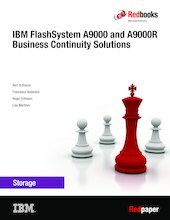 IBM® FlashSystem A9000 and IBM FlashSystem® A9000R provide copy functions suited for various data protection scenarios that enable you to enhance your business continuance, disaster recovery, data migration, and backup solutions. These functions allow point-in-time copies, known as snapshots, and also include remote copy capabilities in either synchronous or asynchronous mode. Furthermore, support for IBM Hyper-Scale Mobility enables a seamless migration of IBM FlashSystem A9000 or A9000R volumes to another with no interference to the host. Starting with software level V12.1, the IBM HyperSwap® feature delivers always-on, high availability (HA) storage service for storage volumes in a production environment. Starting with version 12.2, asynchronous replication between the IBM XIV® Gen3 and FlashSystem A9000 or A9000R is supported. Starting with Version 12.2.1, Hyper-Scale Mobility is enabled between XIV Gen3 and FlashSystem A9000 or A9000R. Version 12.3 offers Multi-site replication solution that entails both High Availability (HA) and Disaster Recovery (DR)function by combining HyperSwap and Asynchronous replication to a third site. This IBM Redpaper™ publication is intended for anyone who needs a detailed and practical understanding of the IBM FlashSystem A9000 and IBM FlashSystem A9000R replication and business continuity functions.